Almost all the business are making allowances for inbound marketing services to promote their products or services seamlessly. According to a recent survey, 86% of the marketers are investing in this particular genre of marketing to uplift the faces of their business. It has become a definitive mean to draw potential and retain the existing customers to a specific landing page. The businessmen are putting their best foot forward to cater their audience with the best possible content at the time of need. However, as internet marketing has become a mainstream platform, the competition is now even fiercer. To make a way through the clutter is a real daunting task. Even after adopting the best possible practices of inbound marketing services, businesses are seeing a nosedive in terms of profitability. Before it’s too late, better gear up by harnessing the effective inbound content marketing strategies right away. Embrace the Coveted Style of Personalization: To elevate the level of inbound marketing services, consider the power of personalization. This will help you to reach your niche customers and potentials delivering the right message across the platforms. You need to work on generating customized content that will act as a catalyst to promote your brand amid the jumbled up scenario. You can use email marketing or SMS to bring value to your business. Stick to Relevance: Sharing what is unnecessary will never help a brand to stand out. The new-age users are no fool. Hence, donning the hat of a marketer, you need to split between the necessaries and redundancy. Firstly, take the initiative by knowing who your audience are, their demographics and their needs. Once sorted, get started with crafting bespoke content catering their requirements. Practicing this religiously can bring in more and more leads within real time. 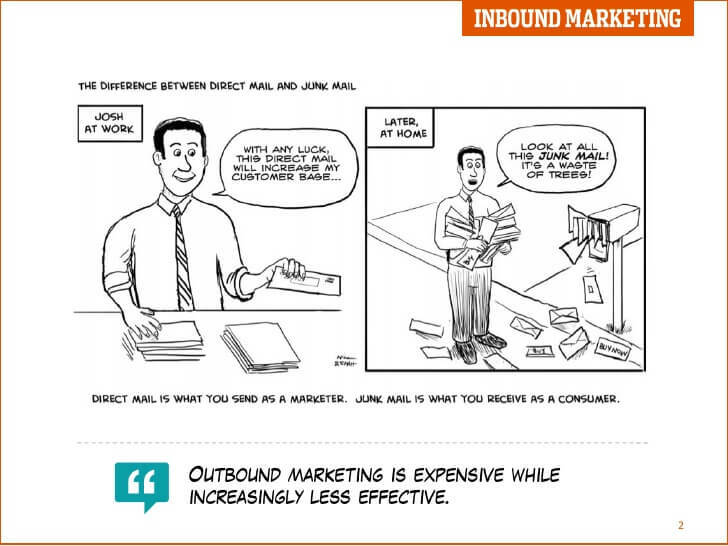 All the successful marketers follow this particular hack of inbound marketing services to save big bucks. Streamline the Audience: This falls under the category of tried and tested method. More often not than it is seen, brands experience a major dip in their sales even after implementing the best content strategy. In such a scenario, instead of going bonkers, keep your calm and narrow down your audience. Instead of targeting the mass, focus on user-specific content giving insights about your product or services. Add Humor: Humor happens to be the most important element in human life. Reading informative long content brings in sheer monotony. This can be a factor leading to increase in bounce rate. So, try and add a satirical or ironic point in the content. For doing so, you can hire a professional content writing agency. The in-house writers trained in different genres will effortlessly craft content that will instantly click with your audience. This is indeed a lesser-known inbound marketing services strategy that the marketers rely on. So, before it gets the tag of a mainstream thing, act smart. Spinning is Not a Crime: Spinning off an existing content is not always a crime if done in an effective manner. For instance, chop of the core content pieces and create something Instagrammable. This is applicable to both audio and visual content. Share such snippets in various social media platforms to increase your sales. Share Stories: Increase your production value, by infusing personal stories in the shared content. This is also a point blank way to attract the readers’ attention. You can add a human touch to your product or service by embracing this unique hack. Emphasis on Keywords: Lastly, work ceremoniously to get hold of the best result yielding keywords. Target the ones which are competitive yet low-searched in volume. Incorporating the right keywords seamlessly throughout the content will help to bring in more and more traffic over the period. So, follow these tips mentioned above and take your inbound marketing campaign to the next level.